Ministry of Sound Audio M Plus review | What Hi-Fi? We enjoyed our time with the Ministry of Sound Audio M last year, so we were looking forward to sharing some with its cousin the Audio M Plus. The ‘Plus’ here effectively means wi-fi has been added to the Bluetooth and 3.5mm jack connections of the original Audio M, welcoming it to Ministry of Sound's new multi-room family alongside the larger Audio L Plus and more diminutive Audio S Plus. Otherwise, it is difficult to spot many differences; both have the same sturdy R2D2-like shell concealing a vertically aligned tweeter and woofer, with touch pad to control your music via a series of taps and swipes on its head. Both also have a claimed battery life of six hours at half volume (four hours at 70 per cent) and both come with a pair of complimentary tickets to Ministry of Sound's London club, access to Ministry of Sound radio and the 'Live from the Club' feed. Given our respect for the original, our spirits are stoked by the similarities in their tech spec. And they are further heightened when we play Huarache Lights from Hot Chip's Why Make Sense? album, to find that same infectious sense of punch to the rhythm. Other similarly priced speakers tend to time a little better, but in terms of drums in particular, few have so much kick. It’s designed by the same engineers responsible for the nightclub's sound system, and as we fight the urge to fidget, it is clear it is clear that Ministry of Sound understands what makes people want to move. It also brings to the fore Alexis Taylor's vocal, buoying it against being drowned out by the force of the kick, despite the slight fragility in his voice. It doesn't skew the balance an awful lot – this isn't the most spacious sound, although there is a decent vertical spread – it is just a forward presentation with a lot of kick. You could argue it’s a very welcome characteristic for a speaker aimed at reproducing dance music. That character remains true throughout the record, but changing tack somewhat as we play Godspeed You! Black Emperor's Asunder, Sweet and Other Distress better highlights some of the Audio M Plus's shortcomings. There is still benefit from the forward presentation, but there is a lack of depth to the detail. Drones in Lambs' Breath are without texture, if audible at all. We aren't requesting hi-fi levels of detail, of course, but we would usually expect more from a speaker at this price. That lack of insight and analysis isn't helped by somewhat flat dynamics. A more subtle dynamic sense would aid enjoyment of dance music as it would larger-scale post-rock. There is a lack of expression here compared with other speakers with more rounded skill-sets. 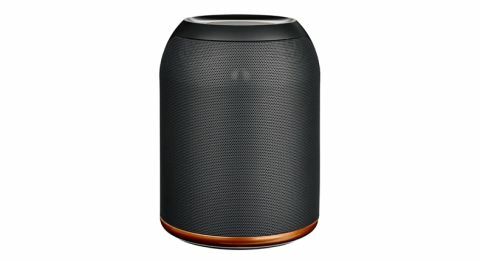 Essentially, it comes as little surprise that the Audio M Plus is no departure from the sonic blueprint of Ministry of Sound's other wireless speakers. While not wanting to lose what makes the speaker great for the money – its contagious sense of beats and solid midrange – we’d appreciate more subtlety that would allow us to enjoy a wider range of music. Still, if you want multi-room and you want to dance, this is a decent solution.